PHILADELPHIA – Dr. Valerie Armstead does not like having “to spend more time fighting with insurance companies” than she does caring for her patients at Jefferson Hospital. “We need a public option now,” she told a crowd outside the Independence Blue Cross headquarters. Dr. Valerie Armstead, professor of Anesthesiology at Thomas Jefferson University. Joyce Moore did not like having to drop health insurance from the menu of financial services she offered her clients who come to her for consultation on retirement planning or socially responsible investments. She did it because she wanted to offer only affordable reliable products. Armstead and Moore were two of the speakers at a center city rally calling for a public option as a necessary part of any healthcare plan that coming out of Washington DC this year. This was the second health care rally in the city in less than twenty-four hours. The previous afternoon over 300 people gathered at nearby Love Park supporting a public option as the bottom line in any health reform package. This rally, part of a nation-wide Move On effort, was also organized on short notice by grass roots activists. Both demonstrations included cultural performances with political content as well as a range of speakers. The Love Park rally was treated to a performance by “Ill Style”, a hip hop dance troupe with social and political consciousness. The event at Independence Blue Cross featured street theatre by Jeff Garis of Penn Action playing the role the insurance industry attempting to control doctors and patients as if they were patients on strings. The attempt was ultimately unsuccessful due to the intervention of the US government in the form of “Aunt Samantha” who saved the day. 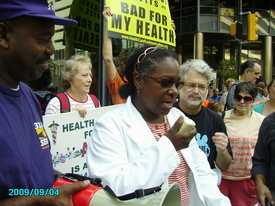 Dr. Armstead, speaking to the World after the rally, ridiculed the notion that the government can’t run health care. She noted that she had been a member of the National Health Service Corps which sends doctors to areas where shortages exist: inner cities, rural areas, and Native American reservations. She attended medical school on a scholarship provided by the NHS in return for a commitment to serve. She noted with irony that she had been able to accomplish this during the presidency of Ronald Reagan under Surgeon General Everett Koop. 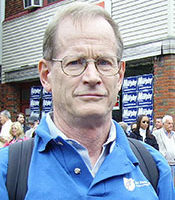 The groups active on the health care reform issue in the Philadelphia area include Healthcare for American Now (HCAN), Healthcare for All Pennsylvania and Healthcare for All Philadelphia. Joan Kosloff and Diane Mohney contributed to this article.